The dive site D-Frame, Oatlands Deep Reef or Wave Rock is an offshore rocky reef in the Oatlands Point area of Simon's Town on the False Bay shore of the Cape Peninsula, near Cape Town in the Western Cape province of South Africa. Map of the dive sites at A-Frame and D-Frame. This is a pleasant reef, not dived very frequently. It is also the point on the west side of False Bay where the 30m contour is closest to the shore. Divers wishing to do a 30m shore dive can do it here. 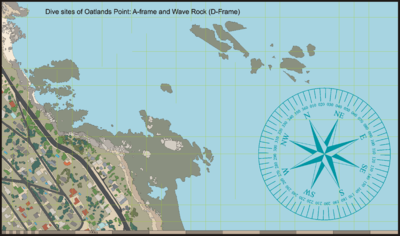 "D-Frame" is a contraction of Deep A-Frame, "Oatlands Deep" is a simple descriptive name based on the nearby Oatlands Point, and "Wave Rock" refers to a rock formation at the reef which looks a bit like a breaking wave. Max depth is 30m (over the sand just beyond the end of the reef). Bottom depth on the sand is about 15 to 20m at most parts of the reefs, and is mostly about 10m over the sand on the way back on a shore entry dive. The reef comprises several ridges of rock running about 300° magnetic with sand bottom between them. There is one point that rises to about 4m from the surface with almost vertical drop to 14m on both sides. Most outcrops not nearly this high. The south reef has an overhanging rock outcrop known as the “Wave Rock”. The bottom is flat sand sloping down very gradually from about 5m near the entry at A-Frame to almost level at about 10m depth for a long way, then down to about 13m at the inshore edge of the reefs. The sand slopes more steeply over the reef zone and is significantly deeper on seaward side. There are areas of sand with wave induced ridges, places where there are black mussel beds and places of coarser gravel, but the general tendency is very flat. The slope is not discernable between shore and reef, though on the seaward side of the reef it is visibly steeper. The reefs are big granite outcrops as is usual in the area, mostly rounded, and with occasional cracks and gullies, except Wave Rock which has a notable overhang. There are several similar isolated outcrops north and south of Oatlands point, extending at least as far north as Ark Rock and south to Pertridge Point. Most of them are virtually unknown to divers and are not yet mapped. Some can be identified from the SA Navy chart. Geology: Granite outcrops of the late Pre-Cambrian Peninsula pluton, surrounded by sand. The site is far enough offshore to be exposed to wind from all directions, which can produce an unpleasant choppy sea, and make it difficult for the boat crew to see a diver on the surface. However it is moderately protected from south westerly swell. It is fairly deep so will not be greatly affected by surge unless the swell is long, but may be quite dark because of the depth. The site is usually at it's best in winter but there are also occasional opportunities during the rest of the year. Poor visibility at the surface does not necessarily extend to the bottom. Be aware that for a shore dive the long swim back may be a problem in an offshore wind. For this reason it is recommended that the return is done underwater. The appropriate Nitrox mix allows this to be done at the bottom as a no decompression dive. If you have gas for a 2 hour dive it can be done from the shore with both trips under water. Boat dive from Miller’s Point or Simon’s Town, or Shore dive from A-Frame for those who don’t mind a long swim, are competent at navigation, and want a 30m shore dive. The sand bottom in the area is fairly fine and feathery sea pens and purple sea pens may be found. Puffadder shy sharks and sand stars are fairly common. Around and beyond the reefs the sand is coarser and in places covered by clumps of common feather stars and hydroids. A considerable number of purple sea pens and cerianthids can be found between the reefs in the 20m depth range. 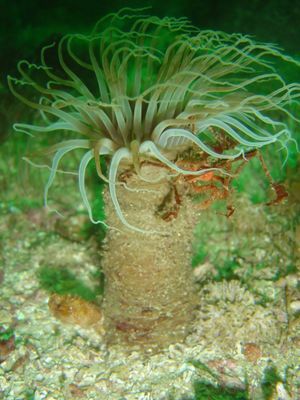 The North reef is covered by vast numbers of Mauve sea cucumbers, with scattered Red chested sea cucumbers and feather stars. Large shoals of Hottentot and several species of nudibranch have also been seen here. The deeper south reefs are covered mainly by Common feather stars, with areas of Mauve sea cucumbers, Striped anemones, and scattered Red bait. There are also other ascidians, sea fans and sponges. Horsefish are sometimes seen in the cracks. Barred fingerfins are often seen on the deeper reefs. A large variety of fish can be seen on a good day. Close encounters with Southern Right whales have taken place in this area. There is an interesting rock overhang known as "Wave Rock", and the shortest distance from the shore to the 30m/100ft contour. Good site for invertebrate photography. Close up and Macro lenses and wide angle lenses will work well for most photographers. External flash is recommended. South Reef (Wave Rock): Entry at slippery rock, out on 067°True (091° magnetic) from the beacon about 525m on surface, dive to bottom and swim to the 15m contour, follow this to the reef. Leave with enough gas for a 30 minute swim back along the bottom on 270° magnetic. If you want a 30m shore dive, the 30m contour is quite close to the South reef. North Reef: Entry at slippery rock, swim out on 048°True (072° magnetic) from the beacon about 460m on surface, dive to the bottom and swim to the 15m contour, follow this to the reef. Leave with enough gas for a 30 minute swim back along the bottom on 252° magnetic. Deep Reef: From Wave Rock swim about 200m on bearing 085° magnetic to the large rock outcrop which ends at about 29m depth at the South Eastern end. 30m is a short swim from the reef, and after reaching the 30m contour, the dive can be continued along the top of the reef until the water is a bit shallower to conserve air and bottom time. Plan on gas for at least an hour at average depth 12m if you want to get back under water. Course 270° magnetic for 730m will get you back to the slippery rock. No site specific hazards have been reported. Offshore wind may increase in strength significantly during the dive. No special skills are required for boat dives, though appropriate certification for the planned depth is expected. The ability to deploy a DSMB is useful to let the boat know where you are surfacing. Shore divers need to be fit and competent at compass navigation, and should choose weather conditions which will allow a return on the surface if necessary. A light helps restore colour lost due to depth. A compass is essential for shore dives, both to find the site and navigate back to the exit point. A SMB or DSMB is recommended as this is an area with a fair amount of boat traffic. Nitrox is particularly useful for shore dives, as it can allow a no stop dive with the trip out and back at the bottom, which is more interesting than the long surface swim otherwise necessary. This page was last edited on 16 April 2013, at 02:49.